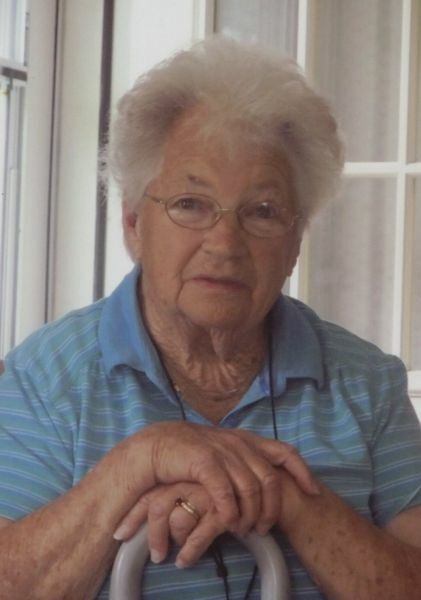 Perham – Eldora A. Dow, 96, the holder of the Boston Post Cane for Perham, died July 6, 2018 at her Perham residence home. She was born in Staceyville, November 27, 1921, the daughter of the late Charles and Effie (Gerald) Mullis . She was 1939 graduate of Houlton High School and married Thomas Dow in 1941. She was employed at Taterstate for many years and was a longtime faithful member of the Perham Baptist Church. Mrs. Dow is survived by her son Arlen and his wife Nancy of Presque Isle, one daughter Sandra Sherman Woollard and her husband Terry of Perham, three grandchildren, Beverly and her husband Mark Turner of Perham, Marlene and her husband Bruce McEachern of Presque Isle and Christopher Dow of Presque Isle, two great-grandchildren, Courtney Howe and her husband Justin of Perham and Evan McEachern of Presque Isle. Mrs Dow was predeceased by her husband Thomas, and brothers;Eursel,Elwood, Charles and Ronald. Graveside services will be held Saturday, July 7, 2018 at 3:00 p.m. at Fairview Cemetery in Perham with Rev. David Goupille officiating.